Gambia's President Adama Barrow is seen in Dakar, Senegal, Jan. 20, 2017. The United Nations has deployed officials to Gambia to help ensure a smooth transition from former President Yahya Jammeh's government to that of incoming President Adama Barrow, according to Dr. Mohammed Ibn Chambas, the special representative of the U.N. secretary-general for West Africa. His remarks came after he briefed the United Nations Security Council on Wednesday about the current situation in the country. In an interview with VOA, Ibn Chambas says there is a need to ensure the security of Barrow and his incoming administration, as well as Gambian citizens. "We need support to ensure the continuity of government. … This is more than just Mr. Jammeh. He is out of the picture. How about the governance structures, the administration, how do you do that?” Ibn Chambas said. “The U.N. has moved very quickly. We have already deployed on the ground an expert on transitions and smooth handover of government who will help in that." 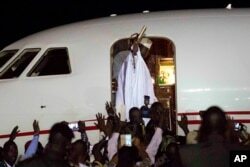 FILE - Gambia's defeated leader Yahya Jammeh waves to supporters as he departs from Banjul airport, Jan. 21, 2017. Finally, Ibn Chambas added, security reform is crucial for the military and police, as well as services such as customs, immigration and the justice system. Long-time president Jammeh was persuaded to step down by regional leaders backed by the U.N. and other stakeholders. During those negotiations with Jammeh, Senegalese troops reportedly surrounded the country. Some Gambians expressed concern about the presence of the troops because of renewed tension between the administration in Dakar and former president Jammeh's government in Banjul. 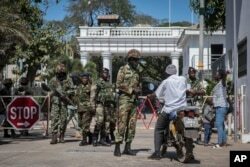 FILE - Senegalese soldiers check a motorcyclist at the entrance of the State House compound in Banjul, Gambia, Jan. 24, 2017. ECOWAS troops have moved into the State House to prepare for the return of President Adama Barrow. Ibn Chambas says it is important to ease any tension caused by the deployment of troops from member countries of the Economic Community of West African States (ECOWAS). "The force that is around there is very much an ECOWAS force, with elements from Ghana, from Nigeria and from Senegal, so they have to share the task … and work very closely with the new government to see how they can very quickly bring the necessary security that is required in the country … so that they can withdraw and then begin to work with the Gambians in a different mode, other than through a full deployment of force," Ibn Chambas said. Barrow was declared the winner of the December 1 presidential election. However, after Jammeh conceded defeat, he refused to hand over power, citing mistakes allegedly committed by the Independent Electoral Commission. Barrow was officially sworn in at the Gambian embassy in Senegal, despite Jammeh’s refusal to step down. Barrow is expected to arrive in the Gambian capital of Banjul on Thursday, days after Jammeh left the country under military and diplomatic pressure from ECOWAS, the African Union and the international community. Ibn Chambas says many Gambians have been anxiously awaiting the arrival of their president. His arrival, Ibn Chambas says, would be the beginning of a new chapter in Gambia.